Our largest cabin has a private bedroom with a queen bed, a full bath, a kitchenette with microwave, fridge, coffeemaker, Direct TV, and futon that makes into a double bed. It has a wonderful deck with patio table/chairs, plus there is a picnic table, log benches, firepit & charcoal grill. Extra guests over 2 persons please add $17 per person inc tax over 2 and for children over 2 years. During Antique Festivals please add $35 per person including tax over 2 persons. We do not break up weekends unless stay is for 3 or more nights during Antique Festivals. Single night stays are allowed during normal times at an additional $15 charge. All prices quoted are cash/check and do not include hotel tax. We can accept a credit card payment through Paypal. There is a small administrative charge for handling credit card payments and the full amount will be charged in advance of the stay. Pets stay free! There is a $50 refundable separate pet deposit. Children under 2 are free – limit 5 people in Rebecca's cabin. We do not provide daily maid service and ask our guests to use their towels more than once to keep down costs and conserve energy. We furnish one towel per person per day (double occupancy unless otherwise added pay). If you require more towels, please furnish your own. Limit 5 people in Rebecca's Cabin. We do allow your children to put up a tent outside cabin at no additional charge as long as the cabin limit is not exceeded. Pets are welcome at Trails West Retreat! Upon check-out, please put towels in shower, trash in outdoor can, turn off lights and TV. Return the premises to the way you found it. Do not leave any trash on the grounds except in containers. Please review our policies by clicking here! Another exterior view of Rebecca's Cabin. The view off the deck looks out over woodlands and creek. To the right is the large bridge. To the left is Stephanie's Garden. Kitchenette has dishes, utensils, a microwave oven, coffeemaker and full refrigerator. The color television has many channels through Direct TV. Linens are furnished. Comfy fouton converts into double bed. Cabin sleeps 4 adults. 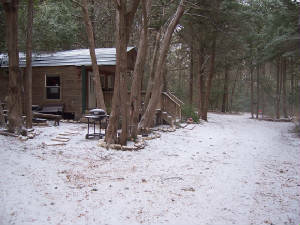 It rarely ever snows at Trails West Retreat so this was a special scene in February 2011. Down the hill in front of Rebecca's garden you will find Stephanie's garden and the creek. This is the location of the footbridge Del built that we call Jack's Bridge after our grandson. Bedroom in Rebecca's with queen bed. The bedroom has a ceiling fan and a vaulted ceiling. 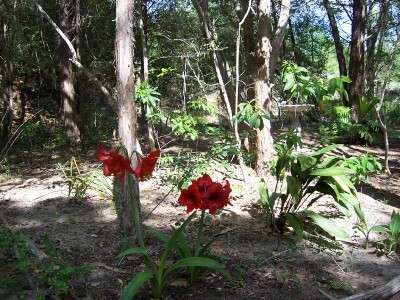 This was the sight looking towards Stephanie's garden from Rebecca's Cabin.